This week we made our first batch of muesli…well, almost muesli. After seeing this video over at Summer Tomato, Derrick and I were both excited about muesli as an alternative to cereal or granola for breakfast. Unfortunately, since we live in Milledgeville, we were unable to find a 5 grain cereal as recommended in the video. We knew that rolled oats would work, but we wanted the benefits of multiple grains. We found this Kashi 7 Grain Puffs cereal, which tastes like a healthier Rice Krispies. The con of the Puffs would be that we do not have the option of eating this food cold or hot, as with traditional muesli. We are on our third day of muesli-eatin’. I have had bowls with both almond milk and Smart Balance Milk. The almond milk brings a sweeter flavor to the cereal and complements the nuts. Mix ingredients together in a big bowl. You’ll know when you’ve got the proportions right. Puffs should be the most used ingredient, and the dried fruit should be the least used. Store in a container to preserve freshness. Derrick says that my blog has basically turned into one where I write recipes for poor people. But seriously, think about my life as a grad student. What do I do all day? I sleep, I write, I teach, I go to class, I watch movies, and I grade papers. Am I capable of doing any or all of these things if I’m hungry? Absolutely not! 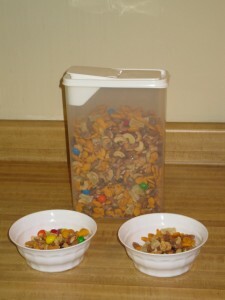 Here’s what I decided belonged in trailmix. What am I missing? I appreciate your help for the next batch.